Have you ever been to the point of emotional exhaustion where you literally stop feeling feelings for a while? 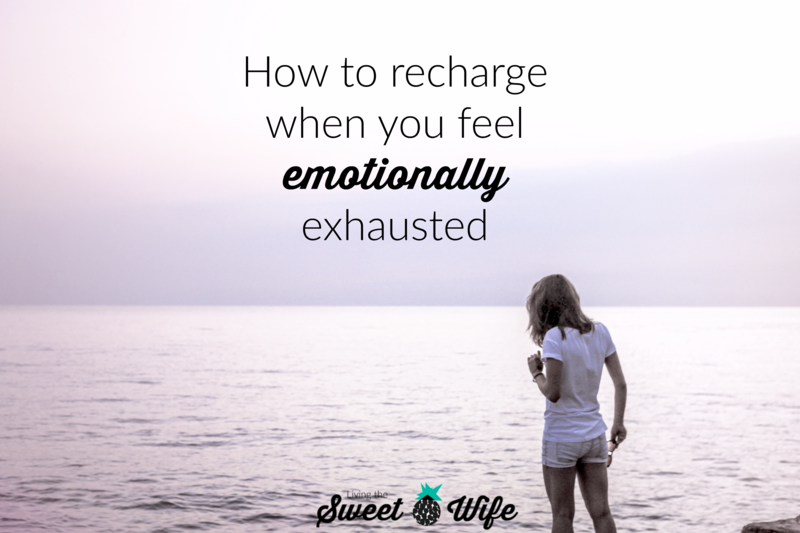 Whether voluntary or not, the numbness of emotional exhaustion is not fun- or healthy- for long periods of time. Here are some tips I’ve compiled to help you get a head start back to an emotionally healthy, energized, and renewed state. Keep in mind that I am not a professional counselor and these suggestions are not intended to treat symptoms of depression. I write about my own experiences and what has helped me and friends of mine deal with emotional exhaustion and come out on top. But not for forever. I’ve found that different people have different napping styles. My husband, Josh, for example, likes to take 20-30 minute power naps. Which I find to be totally dissatisfying. My sister, Sarah, on the other hand, has been known to take 3 hour naps on our living room couch with the toddler playing on his loudest, most annoying toys without waking up. I usually fall somewhere in the middle. During the end of my pregnancy with our daughter, I fell into what they call the “third-trimester blues.” Basically, I was sick of being pregnant, not being physically able to do what I could do before, I was sore and achy, large, had to use the bathroom every 15 minutes, I had shared my body for the better part of a year, and I just wanted my daughter to be here already! I wouldn’t say I was depressed, but I felt pretty glum for a while. During that time, I wasn’t motivated to do anything. I didn’t want to blog, do housework, cook, or even get out of bed for that matter. I basically just wanted to sleep until it was time to have the baby. Now that my two-week old is here laying on the bed next to me as I write this, I realize just how much time I wasted! Yes, when you’re emotionally exhausted, sometimes a huge contributing factor is simply- literally- being sleep deprived. This may not work for everyone, but I almost always feel emotionally renewed (more or less) in the mornings- and especially after the first cup of coffee! I once took a psychology class back in high school. My professor was talking about anger and other negative emotions one day in class and different ways people handle those emotions. One of the negative examples he gave was repression defined here as “the action or process of suppressing a thought or desire in oneself so that it remains unconscious.” So, basically, bottling it up and hoping it just goes away. Likely? Probs not. However, one positive example he gave was when people use their negative emotions to focus on something productive. This article from the Huffington Post helps back this theory up. Now, I understand we’re talking about being emotionally exhausted. But if you’re anything like me, when I feel emotionally exhausted, ironically enough, sleep is one of the last things I want to do. I actually feel a sense of restlessness which gives me energy and a desire to do something. Basically anything for a change of scenery. So, next time you’re feeling the restlessness of emotional exhaustion, try getting out for a run or lifting weights at the gym. Or maybe try picking up an old hobby that you haven’t had much time for recently. I used to love to write all the time, but before I started blogging, I had more or less lost that hobby in the business of life. The time when I started blogging was an emotionally exhausted one. I started blogging simply as a creative outlet but since then it has blossomed into a way for me to help others as well as help to earn an income for my family! All that being said, use the emotion you’re feeling and channel that into energy to do something beneficial and productive! When I started writing this point, my first instinct was to say, “Avoid listening to sad music.” But then I realized, that when I’m emotionally distraught or exhausted, sometimes listening to music that is relatable to how I feel makes me feel understood! But. Do be careful to avoid music that will just bring you down further. I may just be an old soul, but I like listening to classical or instrumental music that I feel illustrates my feelings without words. However, when I’m about to do something that I mentioned in my last point (like clean the house, get creative, or workout) I LOVE to listen to empowering, energizing music. Something about that music makes my problems seem smaller or further away and gives me a few moments happier, more uplifting emotions. See how different types of music affects you emotionally and listen to the ones that encourage and energize you and help to bring out of an emotionally exhausted state. You know, sometimes a good ole pick me up might be just the thing you need to help make your day a little brighter. Not that I want to promote materialism or am saying that you can find long lasting joy in a new outfit. But all other things aside, sometimes it’s nice just to get something new to feel like you’re getting a fresh start. You don’t have to go cray cray- I’m more of a Target/TJ Maxx girl, myself- it doesn’t take a lot to make me happy. Sometimes all it takes is an afternoon coffee stop and I’m already on my way to a better second half of the day! Now might not be a great time to make the decision to get that haircut you’ve always been too afraid to go through with. But you can do up what you have. I always feel better when I know I’m put together and the yoga pants are in the laundry. That’s why, for whatever reason, when I’ve had a late night, am pmsing, or have just gotten over a fight with the hubs (yes, it does happen) I like to put my big girl pants on (literally), put on some fresh mascara, and get out of the house for a bit. Which leads me to my next point. Now, while I think having a friend that you can trust is uber important. BUT. If the thing you need to talk about is something between you and your spouse, try your best to resolve the issue between the two of you. Of course, if it’s an issue such as anger, abuse, infidelity, etc. then by all means, speak to a friend. But most common marriage issues can and should be resolved relatively quickly and just between the two of you. Great marriage partners become pros at hashing it out, they don’t need their friends to give them ammo and back them up. 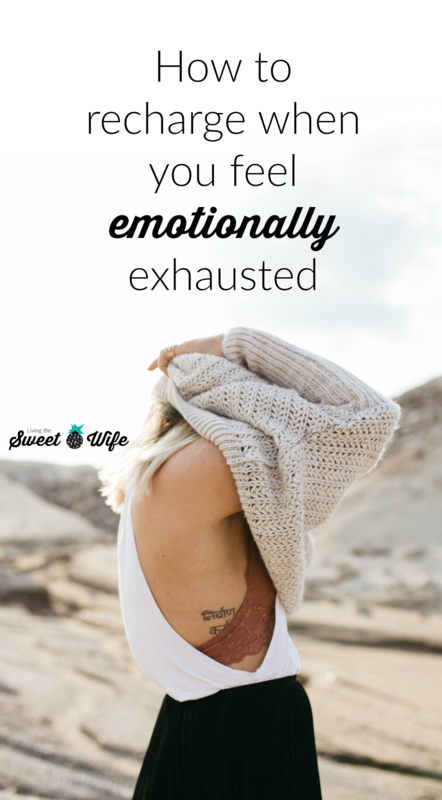 You could be emotionally exhausted because of your spouse or a million other things that have nothing to do with your spouse. Simply feeling alone could be making you feel the way you feel. Getting out and talking with a friend about what’s going on may be just what you need to start making a turnaround. Just make sure your friend is someone who you know will be good at encouraging and edifying you, and if nothing else, just listening to you. Don’t choose a friend who will simply drown in your sorrows with you. It might feel nice, but it’s not going to do anything to help. Conversely, you may just want to be alone. Or you may just need to be alone for a while. Sometimes what I like to do is find a quiet place outdoors, preferably under a tree, and write about what’s been going on. I like to write in a prayer journal I have (but since I’m disorganized as heck, I usually write in any book I can find with blank pages in it). Writing to God feels so much better than simply writing in a blank book that I know no one is ever going to see. Whether or not I’m in the right or wrong, or whether my feelings are justified or not, I know God wants what’s best and by talking with Him, I can realign myself with what’s best, too. It also helps me to do what my next point talks about. Sometimes (ok, many times) I’m emotionally exhausted because I’m insecure, nervous or scared of something, or feeling as though I deserve better. Whatever the reason, if I can get to a place where I can remember that I was created for a purpose, that I am inherently valuable (despite my shortcomings and mistakes), and that I have unique gifts and abilities that others don’t have, I give myself the chance to take a deep breath, and remember that I do have the ability to get through what I’m going through. I’ve been given the gift to make educated and wise decisions and although I can’t control what others do, I can control what I do. Not only that, I decide what standards I choose to follow, and if they’re higher than other’s standards, then so be it. So, what about you? What are things you do that help you climb out of a state of emotional exhaustion? Leave your suggestions and thoughts in the comments below and share post this with a friend in need! Great tips! I take naps when my kids nap, I love baking and sewing and I also exercise a few times a week to keep me energized and stress free. Ok – you nailed it on your first point about sleep. I need to be better with sleeping and taking care of myself in that way. When I lose sleep, I can feel the UGH effects even days later. These are all great tips! I get depressed from time to time, and it’s usually from just pure exhaustion, mentally. Time alone is my number one, while listening to music. I do all those types of naps. Sleep is my go to when emotionally tired. Otherwise I get coffee by myself. It’s important to take care of ourselves. Sleep! That’s what I need more of. I hate when you are emotionally drained. It feels awful and truly exhausts you. These are great tips!! I’ve used many of them! I get so much happiness from listening to music and especially going to concerts! I also have been trying to spend more time on hobbies lately that I had not been for awhile! Painting, crafting and writing makes me feel so energized! I loathe cleaning my house but always feel so much better when it’s done! Not my idea of a good time but the process and the outcome definitely pick up my spirits when I’m drained. I always find that sleep helps me recharge. When I can’t fall asleep, I turn to music or relaxation videos to help me get out of my head. I like to read a book a lot of the time to get away from the every day life. Helps me clear my head. These are awesome tips and I find myself doing a lot of these to recharge. I tend to absorb a lot so making time for myself to recoup is a necessity for me to keep going. I’ve been feeling emotionally drained these past few weeks, so I will be giving some of this tips a try asap! Great tips. I find that losing myself in an art project is such a healthy way for me to recharge. I think all of these things work at one time or another. Yesterday I had a really frustrating day, so I took a short drive with my music up and windows down. 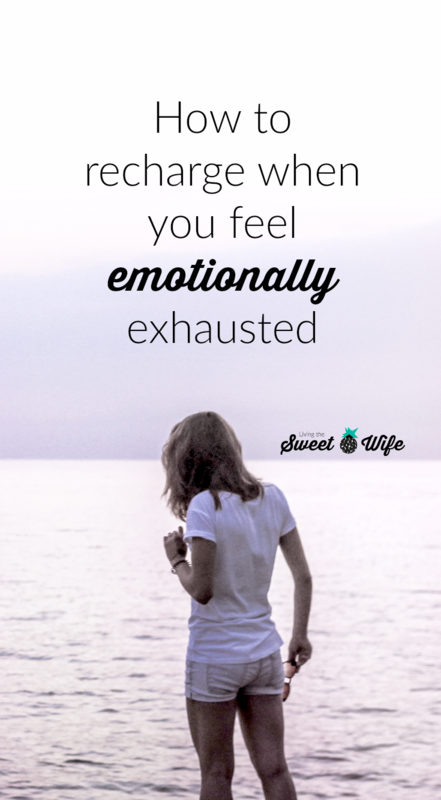 It was exactly the recharge I needed! Sleep definitely helps me start with a new beginning after something that has made me very emotional. My new thing is to get walking. It gets my mind off of things too. I’m definitely emotionally exhausted! My only problem is I love spending some time alone but as soon I leave I instantly miss my kid. I would go out by myself and come home within 30 minutes later because I miss my baby. It’s a serious problem here!